What if you can always enjoy the feeling of melting hot chocolate over lips?! Won’t it add to the calories? No because every rub is worth enjoying with a personalized chocolate lip shimmer w/white tube cap. This lip balm is hot favorite of chocolate crazy Americans because it offers them happy and crack free chocolate laced smiles and keeps them on high. Health Quotient – Animal Cruelty- free. All FDA approved ingredients used for formulation. Cream chocolate flavor. PABA free. Harsh shimmering substances or other product manipulators avoided. Hypoallergenic. 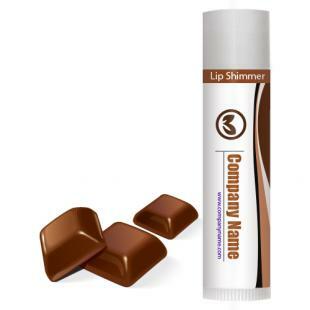 Directions – Rub cream chocolate lip balm over impaired lips. Discontinue usage if any irritation occurs. Avoid rubbing it over face or other areas of body for healing weather inflicted irritations. Gifting Favors – Personalized chocolate lip shimmer w/white cap is largely affordable for everyone. We usually process orders for this lip balm during celebratory occasions such as weddings, anniversaries, birthdays, etc.